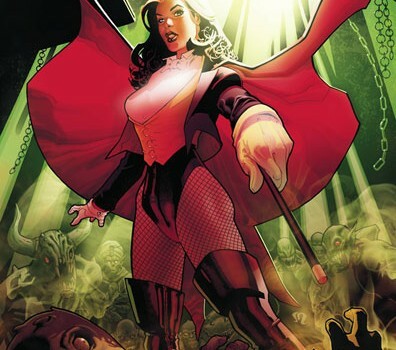 Garder Fox’s Zatanna Zatara receives her first ongoing series after a mere half-decade. While the buxom illusionist received a limited series in the 90s and another under Morrison’s Seven Soldiers project, Paul Dini’s latest sees her distanced from the Justice League and focussed on combating DC’s magical mischief makers alone. Dini has long expressed his love for this character, and one would assume that he’d have had an ace up his sleeve when it came to plotting this collection’s two storylines. The first arc kicks off with Zatanna investigating an inventively gruesome murder scene courtesy of the satanic Brother Blood, but runs out of steam with the introduction of Fuseli, an unearthly mind-intruder based on Henry Fuseli’s painting The Nightmare. 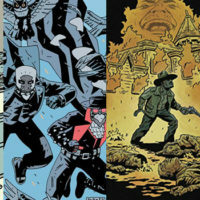 The second outing sees the conjurer hit Las Vegas, coping with the Royal Flush Gang, demon Mammon and her bothersome cousin Zach, and nearly falling foul of a shotgun wedding. Neither plot realises the potential occasionally hinted at, but it’s a fun series, and Zatanna’s charmingly naff ability to make her every whim a reality by speaking simple commands in reverse never tires. Doctor Strange’s nemeses were often akin to gods, pushing the Sorcerer Supreme to his limits. The cabal of lesser foes Zatanna faces in this volume provide little challenge for her magical abilities, and the trade ultimately feels like a double whammy of breezy Saturday morning cartoons. Given Dini’s pedigree this is feint criticism, but currently The Mistress of Magic is really only recommendable to those already invested in Giovanni Zatara’s prodigous daughter.